Preheat the oven to 200ºC (180ºC for fan assisted ovens), gas mark 6.. Light brush the inside of the tortillas with the melted butter. Place on an ungreased baking sheet. Bake for 4-5 minutes or until the rims of the tortillas are lightly browned. Leave to cool. Fill each tortilla with the strawberries, blueberries and mango slices. 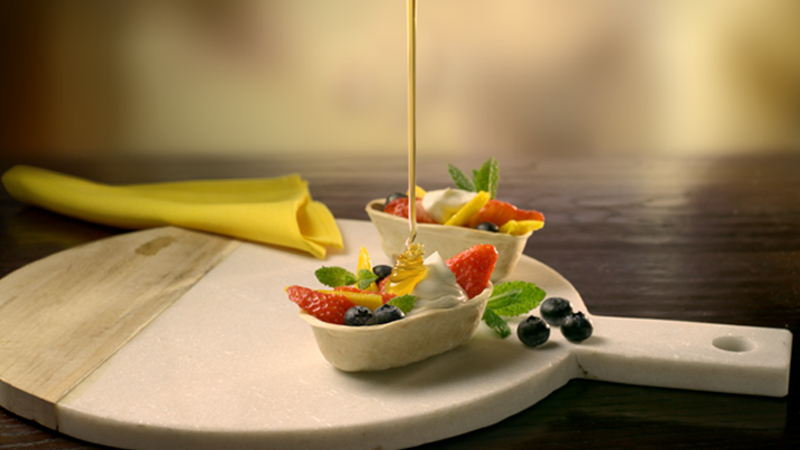 Top with a spoonful of yogurt and a drizzle of honey. Decorate with a mint sprig, if using and serve immediately. You can bake the tortillas a day in advance and store in an airtight container. Fill just before serving. Mix a little ground mixed spice or cinnamon with the melted butter for a warming sweet spicy flavour.